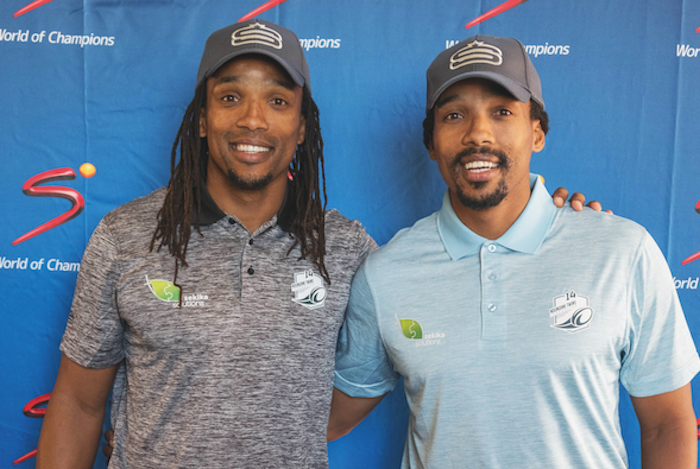 Akona and Odwa Ndungane are two former rugby players are using their passion for golf to give back to their community, writes WADE PRETORIUS in Compleat Golfer. The Ndunganes are two of the most recognisable figures in South African rugby, although being twins who both played wing, it was a little difficult at times to separate them. For the brothers, who grew up in rural Eastern Cape, there’s no separating their ambition post-rugby as they look to give back and pour their expertise into their community in an attempt to uplift a few talented rugby players and perhaps unearth the next Ndungane-like player. As they unravelled their last bit of red tape in setting up the Ndungane Twins Foundation, it was a quick turnaround to their launch event. The Ndungane Golf Challenge saw a number of their former teammates take sides in a Bulls vs Sharks outing at Serengeti Estates. The hard part might have been the logistics behind the bureaucracy, but it couldn’t have been easier to secure big names, such as legendary Springbok duo Fourie du Preez and Victor Matfield. ‘I’d barely finished telling Fourie about the day and what it is for and he said, “I’ll be there.” That’s the kind of friendship and bond we built up in our team. I’m glad he came because he signed up before even knowing the date,’ says Akona. The former Bulls flyer now proudly adds his name to the list of retired professional sport stars who are addicted to the game. He owes his introduction to Bryan Habana, who invited him to tag along on a day off in New Zealand. ‘He wasn’t able to offer any advice because he was only starting out, but the best thing he said was that I must just go out there and enjoy myself, and I did. I was hooked immediately and have worked hard on my game since,’ says Akona, who admits he was sceptical about the sport. Odwa, playing off a 14, has a slightly different version of events. ‘I’m convinced the scorers were persuaded to let the “home” team win. I mean, you don’t want to see a bunch of Pretoria guys after they lose,’ he says with a smile. If it was Habana for Akona, Odwa owes the discovery of his new passion to AJ Venter, the former Springbok flank who invited him out during a team-building at Champagne Sports Resort. ‘I never really had the time for golf in the beginning. The guys would always go off and play but I never joined them until I played with AJ one day and had such a great time,’ he says. The twins’ competitive nature is only one indicator that their foundation is likely to be a success. The other is that, like their looks, they share a common goal as the theme of pouring back into the lives of those less fortunate and taking it step by step from there is evident. ‘We were fortunate in the sense that our parents could afford to send us to a good school. That was a massive advantage and things kind of fell into place. We knew where we came from and were determined to make it count,’ says Odwa, who’d love nothing more than to see a new crop of Mthatha boys make it in the big time. ‘The goal for us is simple – we are trying to give some youngsters the chance of a better life. We’ll walk alongside them and help place them in good rugby schools with good people. It’s a mixture of trying to help them become better people and as sportsmen,’ he adds. Beneficiaries who do make it will also be represented by Akona, now a fully licensed agent, and someone acutely aware of what it takes to make a living and prepare for life after professional sport. But both twins are keen to set small goals as they are aware of the types of struggles this venture is going to face. a 16-year-old to move away from home; that’s another set of challenges so we need to take it slowly,’ Odwa says. While the plan has been laid out, long term the twins would like to branch out to more sports and afford the opportunity to girls too. The first Ndungane Challenge was the perfect start, with the day running smoothly and a sizeable injection of capital meaning it won’t be too long before players are placed in their new schools. ‘I was privileged to be at the first Ndungane Challenge hosted by two great men, who continue to make a difference.’ Those were the words of former Springbok skipper Smit, another legend throwing his weight behind the twins and their cause. The twins are safe in the knowledge that they can always count on the support of their former teammates, sharing South Africa’s passion for advancing good causes and using golf as the tool that brings everything together.